After Iran's Supreme Leader calls Israel a cancerous tumor on Twitter, the Israeli Embassy mocks him with a GIF. 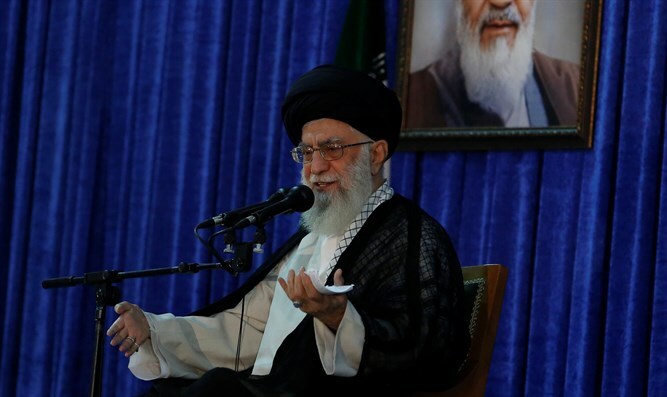 Iran’s Supreme Leader, Ayatollah Ali Khamenei, issued yet another threat towards Israel on Monday, calling the Jewish state “a malignant cancerous tumor” in the region that must be destroyed. “Our stance against Israel is the same stance we have always taken. Israel is a malignant cancerous tumor in the West Asian region that has to be removed and eradicated: it is possible and it will happen,” tweeted Khamenei. The IDF Spokesperson’s Unit had a more serious response to Khamenei’s tweet. “The true face of Iran. The true face of Hamas. The true face of the ‘Great March of Return,’” it tweeted. Khamenei on Monday also warned of the country's harsh response if attacked by enemies of Tehran. "Tehran will attack 10 times more if attacked by enemies... The enemies don't want an independent Iran in the region... We will continue our support to oppressed nations... our enemies have staged economic and psychological warfare against us and new American sanctions are part of it," he said in a speech broadcast live on state TV. The Supreme Leader has several times in the past referred to the Jewish state as a “cancer” and threatened to "annihilate" the cities of Tel Aviv and Haifa.